To help further clarify my simple 3 step process for making money online, this post will go through the entire process of step number one, which is finding an audience. 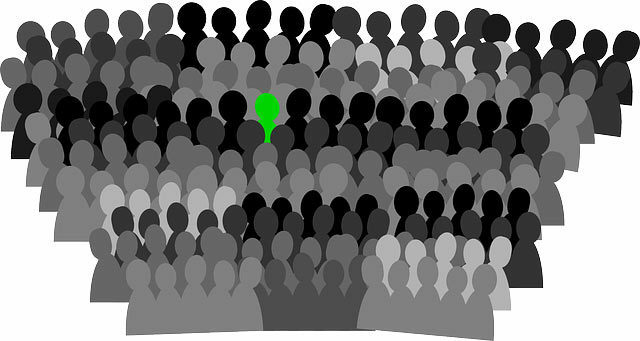 Now remember, you aren't looking for just any audience... You need to have a hyper-targeted audience of people who have a specific problem that creates urgency that leads them to search for and spend money on solutions. If that sounds complex or difficult at first, don't worry. I will not only explain how to figure this out and I'll also be going through an example here as well, so you can see each step and understand the thought process behind each step, while we research a hyper-targeted audience together. Real quick, though... I must re-emphasize how important this first step is. When I first started marketing online, I made the rookie mistake of selecting a product I liked, that I was 'passionate about' and spent countless hours building a site and marketing materials around that product. Turns out that no one was searching for or purchasing these online. Had I done the proper research, first... I would have not only saved that time and energy, but I would have been able to focus it towards an audience that was actually searching for solutions and buying them online. When you do find an audience and problem that is undeserved, you are truly expediting the process of making money online, so this research step really does have a huge impact on your short term and long term income potential. Ok, with that said, lets get to it! There are a few main categories of problems that are known to be the 'most valuable' because they are such wide-spread problems and people are constantly looking for solutions in these areas. Generally speaking everyone could use a little help in at least one of those categories. But to simply focus on 'Dating', 'Losing Weight' or 'Making Money' is not focused or targeted enough. These are the starting points and you will need to drill down deeper and deeper through research to find a super-specific and focused problem that a specific group of people have and are actively searching for and buying products that will help them solve the problem. Now, don't just browse the top 100 books on Amazon. Use the category navigation on the left side to drill down into the sub-niches to find that targeted audience. Bingo! These are the first glimpses into the sub niches and I'll start with this info and drill down even further. You see... In our fast paced, technologically accelerated day-and-age, people don't really ask friends or relatives for help with their problems anymore. Most people turn to Google as their trusted advisor for all kinds of questions and problems. These tools offer incredible insight into 'mass consciousness' and they also an incredible amount of information regarding specific phrases and topics that people are searching. Honestly, the data from within these tools is absolute GOLD because it will help you learn how to figure out how many searches per month a specific keyword phrase receives With this you can understand the size of the audience and the exact phrases they are searching for. Personally, I really like hyper-targeted audiences that have a core keyword with approximately 10,000 monthly searches... Give-or-take a few thousand. Ok, so how do we find that magic audience? ...Lets keep going! At this point, I'm curious to find out which of the 3 sub-sub categories I found from the Kindle research (Yoga, Aerobics or Running & Jogging) is more popular, so I'll head to Google Trends. Here I enter 'Yoga' into the search bar and click the search button. Once the results page comes up, there is an option to '+Add Term' and I'll add all the other terms, so Google displays them all together. 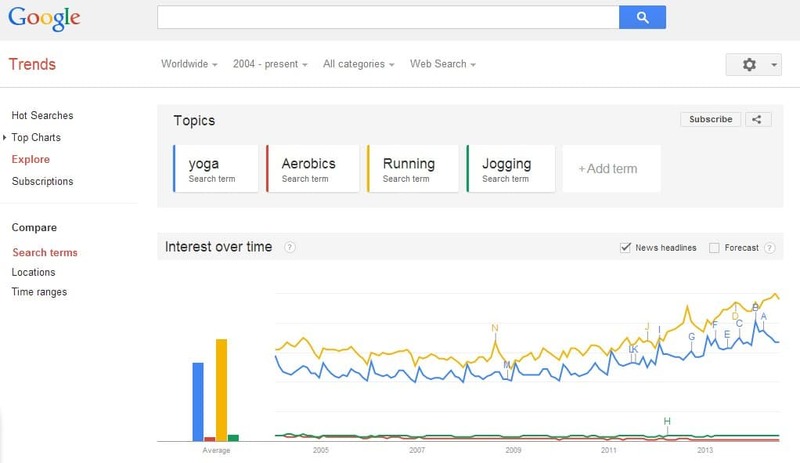 With all of the phrases graphed out, color coded, it is very easy to see that 'Running' and 'Yoga' are the most popular and their 'trend line' is moving upwards, which means that there is growing interest in both niches, which is also a good sign for long-term viability. Great! Now, we want to keep digging deeper, because we aren't at the super-targeted audience, yet... But we do want to stay focused in these two more popular niches and we are getting closer. For the next level of research, we turn to Google.com and use the search engine's auto-fill or suggestion function to help us understand some of the more popular searches around these phrases. At this point, I opened up two windows, both at Google.com, I type 'Running For' in the first one and let google 'suggest' a few options for me. 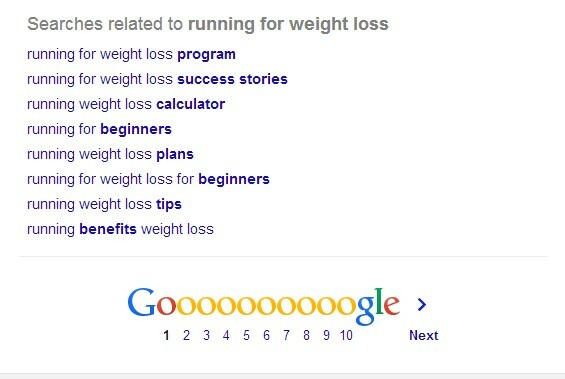 I choose 'Running for weight loss' and search that phrase... Then, on the first page of Google results, I scroll to the bottom of the page and see even more 'ideas' from Google. In the other window I simply begin typing 'Yoga For' and Google automatically comes up with a couple of very interesting insights. Most interesting to me here is "Yoga For Back Pain" because this is a definite PROBLEM that HURTS and there is really no ignoring this kind of an issue, so someone will 'try just about anything' to get rid of back pain. Also interesting is that 'Yoga for Runners' seems to be a recommended search and that could literally double our 'market size' by combining both... But let's see what the data says. Now we must check to find out if people who search these phrases often purchase items and there are a couple ways to do this. The first is to search those specific phrases that are super targeted to see if there are any sponsored ads on Google for them. At this point in the process, we WANT to see competition. Competition means that other marketers and product creators are making enough money selling these kinds of products that they have advertising budgets. If you see no sponsored ads in Google, cross it off your list because the market is too small or there is simply no money in it. You can tell the paid ads as they show up at the top, bottom and on the side of Google results pages and they have a small yellow 'Ad' icon next to the web address. So, we will also see what the average cost per click is on each phrase and use that as a guide to see if people are running paid advertising campaigns for these phrases. 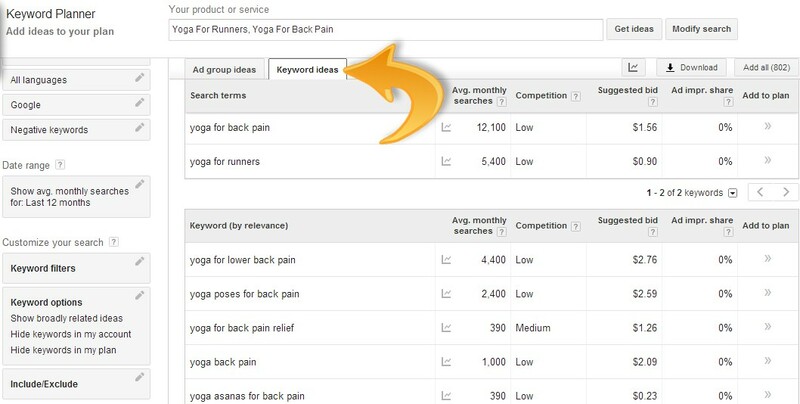 At this point, the two top contenders are 'Yoga for runners' and 'Yoga for back pain' and I'm already leaning towards the 'back pain' ones because it is an URGENT PROBLEM... Next, lets run them through Google's keyword tool to find out how many monthly searches they get, how many other related phrases google thinks are relevant and the average Cost Per Click someone pays for each phrase. And then click on the "Avg. Monthly Searches" column heading to sort with the highest search volume up top. At this point, for this example, I am confident that we have enough data to say conclusively that 'Yoga For Back Pain' is the superior hyper-focused niche. You can see that this phrase is searched more than twice as much per month and there are dozens of variations of 'Yoga For Back Pain' that get searched tens of thousands of times per month, too. The core keyword is right in my preferred 'sweet spot' of about 10,000 searches, give or take a few thousand, too. Also, if you notice in the 'Suggested Bid' column, there are higher dollar values, which further reinforce that there is competition paying for clicks, which is a very good thing, because it proves that customers are PAYING for SOLUTIONS... 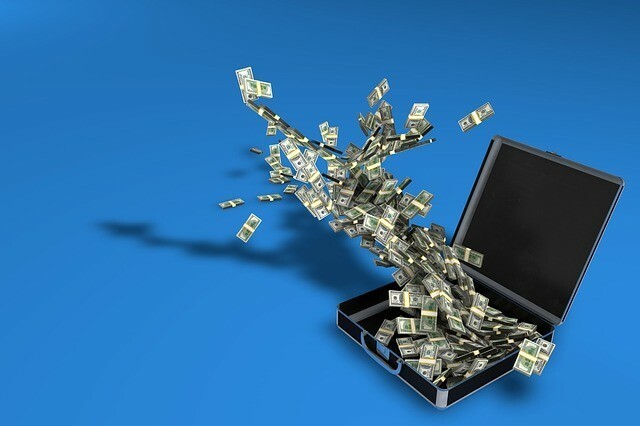 Which means you can make money in this niche. That also confirms my suspicions that I was not seeing all of the paid ads because I happen to be writing this post from Mexico. The last step we want to accomplish is to make sure there are affiliate products about this niche that we can promote and make money on. To do this, simply go to the ClickBank Marketplace and search for 'Yoga' to see if there are any informational products about Yoga... And indeed there are several. Ok, that is just about it for step one in our 3 simple steps to make money online process with a real-world example to help you see how all the resources and tools work together in conjunction with the though processes behind each part. There is a tiny bit more research that we will go through at the beginning of step 2, but all signs and data point to the fact that this is a great hyper-targeted niche to start with. Is this specific niche the niche for you? Well, if you love Yoga, or are a certified Yoga instructor, maybe. If you don't love Yoga, you can go back to the first research steps and continue to browse Amazon's categories to get other ideas that may interest you more. The more personal interest you have in the audience and niche you choose to enter, the better, because as you move onto the next steps in the process and ultimately marketing, it all works easier and persistence comes easier when you are actually interested in the subject you are working with. For now, dig into research and find your hyper-targeted audience! Hi Mr. Beckler! Firstly, I want to say that you produce awesome content. I came across your Youtube channel some time ago and I really appreciate the in depth explanations that you give. I have a YouTube Channel where I teach how to speak Mandarin Chinese and I need help learning how to do Online Market Research. As I watched the video "Keyword Research With Google's Keyword Planner - Keyword Results In Seconds," I got confused how you combined the 30 Challenge keyword with the Youtube keyword, even though the 30 Challenge keyword leaned more towards the idea of weight loss. But in summary, I feel that I still do not have a complete understanding of the steps that I need to follow to properly perform Market Research. It is my understanding also that at some point that Market Research is supposed to help me create a customer avatar. Do you have a series of blogs or videos that explains chronologically everything ones need to know to perform great Market Research? I am a very thorough learner and I would greatly appreciate your help. #2 is not narrowing the niche... "Learn Chinese For US Business Owners" or "Learn Chinese For Malaysian Students" would be. Really, shifting from 'researcher' to 'creator' is key!